Mayra is a young professional who came to our office on a referral for Invisalign braces. She did not like the way her teeth looked and she had several aesthetic concerns. We started Mayra with Invisalign. We wanted to correct her alignment issues. She had crowding on the upper/lower teeth and it was affecting the stability of her bite. Her case was rather simple and straightforward. 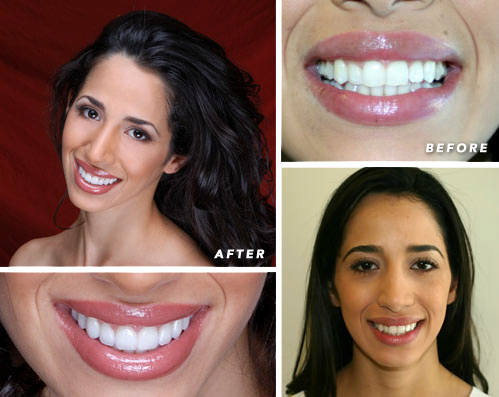 A Smile Design treatment was needed to completely give her what she was looking for. Mayra already had full lips to frame her new smile, but her smile was lacking in terms of dimension. She displayed uneven gum contours and proportionally her teeth were short for her smile line. They were also not as white as she desired. “Once I decided I had to improve my smile, I wasn't ready for such a dramatic improvement. Dr. Gombert and Dyana's work is outstanding and the results far exceeded my hopes. Wow! A simple thank you just doesn't seem to be enough. The staff at Parkside Dental always made me feel taken care of and totally welcome. Their professionalism and courtesy is first rate. Looking back over the entire process, it is difficult now for me to understand why I ever had apprehension about having this work done. Mayra’s smile is now in complete harmony with her facial features. Mayra’s case is a wonderful example of what Smile Design can accomplish. The final result is gorgeous and perfectly natural.